Alessandro de' Medici (22 July 1510 – 6 January 1537) called "il Moro" ("the Moor") due to his dark complexion, Duke of Penne and also Duke of Florence (from 1532), was ruler of Florence from 1531 to his death in 1537. 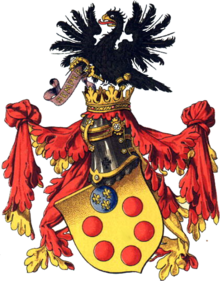 The first Medici to rule Florence as a hereditary monarch, Alessandro was also the last Medici from the senior line of the family to lead the city. His assassination at the hands of a distant cousin, Lorenzaccio, caused the duchy of Florence to pass to Cosimo I de Medici, from the family's junior branch. Born in Florence, he was recognized by the majority of his contemporaries as the only son of Lorenzo II de' Medici (grandson of Lorenzo de' Medici "the Magnificent"). A few believed him to be in fact the illegitimate son of Giulio de' Medici (later Pope Clement VII), nephew of Lorenzo the Magnificent, but at the time that was a minority view. Alessandro's nickname "il Moro" ("the Moor") is said to derive from his features. Some historians (such as Christopher Hibbert) believe he had been born to a servant of African descent who was working in the Medici household, identified in documents as Simonetta da Collevecchio. The French author Jean Nestor, writing in the 1560s, reported that the claim of a Moorish slave origin was a false rumor first spread by Alessandro's exiled enemies in Naples. When Emperor Charles V sacked Rome in 1527, a faction of Florentines took advantage of the turmoil in Italy to reinstall the Florentine Republic. Both Alessandro and Ippolito de' Medici fled, along with most of the Medici and their main supporters, including Cardinal Silvio Passerini, (the regent for young Alessandro and Ippolito, and de facto ruler of Florence for Pope Clement VII). 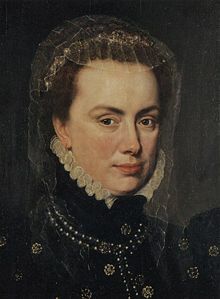 Eight-year-old Catherine de' Medici was left behind. Michelangelo, then occupied in creating a funerary chapel for the Medici, initially took charge of building fortifications around Florence in support of the Republic; however, he later fled the city, fearing retribution. Eventually Clement made his peace with the Emperor, and in the summer of 1530, following a lengthy siege supported by Imperial troops, the Medici were restored to power. In 1530, Clement VII assigned Florence to nineteen-year-old Alessandro, choosing him for the position over Ippolito (the latter was made a cardinal). In the meantime, Alessandro had become Duke of Penne, an appointment purchased from the Emperor. He arrived in Florence to take up his rule on 5 July 1531, and 9 months later was made hereditary Duke of Florence by Charles V (as Tuscany lay outside the Papal States). This signaled the end of the Republic. Alessandro's many enemies among the Florentine exiles declared that his rule was harsh, depraved and incompetent, an assessment debated by historians. One relic of his rule sometimes pointed out as a symbol of oppression is the massive Fortezza da Basso, a fortress that is today the largest historical monument of Florence. 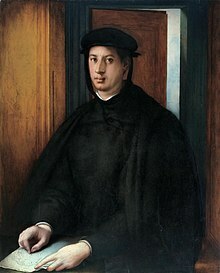 In 1535, the Florentine opposition sent his cousin Ippolito to appeal to Emperor Charles V against some actions of the duke, but Ippolito died en route. Rumors spread that he had been poisoned at Alessandro's orders. In a late replay of the kind of medieval civil politics that had long revolved around pope and emperor, commune and lord, Emperor Charles V supported Alessandro against the Florentine exiles. In 1536, Charles V married his natural daughter Margaret of Austria to Alessandro. For his own inclinations, Alessandro seems to have remained faithful to one mistress, Taddea Malaspina, who bore his only children: Giulio de' Medici (c. 1533/37 – 1600), who also had illegitimate issue, and Giulia de' Medici. In 1537 his distant cousin Lorenzino de' Medici, nicknamed "Lorenzaccio" ("bad Lorenzo"), assassinated him. (This event is the subject of Alfred de Musset's play "Lorenzaccio".) Lorenzino entrapped Alessandro through the ruse of a promised arranged sexual encounter with Lorenzino's sister Laudomia, a beautiful widow. For fear of starting an uprising if news of his death got out, Medici officials wrapped Alessandro's corpse in a carpet and secretly carried it to the cemetery of San Lorenzo, where it was hurriedly buried. Alessandro was survived by two natural children of Taddea's: a son, Giulio (aged four at the time of his father's death) married to Lucrezia Gaetani, and a daughter, Giulia, married firstly to Francesco Cantelmo, the Duke of Popoli, and then to Bernadetto de' Medici, the Prince of Ottajano. ^ a b c d "Africans in Medieval & Renaissance Art: Duke Alessandro de' Medici". Victoria and Albert Museum. Archived from the original on 5 January 2019. Retrieved 6 May 2018. ^ A. London Fell (September 1993). Origins of legislative sovereignty and the legislative state: Modern origins,developments, and perspectives against the Background of "Machiavelism".Book I: Pre-Modern "Machiavelism". Praeger. ISBN 978-0-275-93975-5. Retrieved 12 January 2012. ^ Catherine Fletcher, The Black Prince of Florence: The Spectacular Life and Treacherous World of Alessandro de' Medici (London: Bodley Head, 2016), pp. 16, 280–81. ^ George L. Williams (January 2004). Papal Genealogy: The Families And Descendants Of The Popes. McFarland. pp. 74–. ISBN 978-0-7864-2071-1. Retrieved 12 January 2012. ^ * Bedini, Silvano A. (1997). 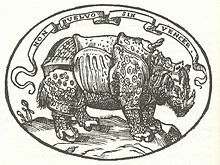 The Pope's Elephant. Manchester: Carcanet Press. p. 192. ISBN 978-1-85754-277-6. .
^ Baker, Nicholas Scott. 2010. "Power and Passion in Sixteenth-century Florence: The Sexual and Political Reputations of Alessandro and Cosimo I De' Medici". Journal of the History of Sexuality 19 (3). University of Texas Press: 432–57. ^ Cfr. PASCUAL MOLINA, Jesús F. (2009). "Alexander Florentiae Dux: el primer duque de Florencia y el Imperio. Muerte, política y arte" en Parrado del Olmo, J. M.ª y GUTIÉRREZ BAÑOS, F. (coords. ), Estudios de historia del arte. Homenaje al profesor De la Plaza Santiago. Valladolid: Universidad de Valladolid. pp. 161–166. ISBN 978-84-8448-521-6. Wikimedia Commons has media related to Alessandro de' Medici.